Making a Rice Krispie Treats recipe? Make these simple, gooey, classic treats even better than the original by using browned butter, vanilla and Peeps! My favorite thing about Peeps is heating them up in the microwave until they almost explode. I don’t tend to do this with the bunny ones, but the duck ones? Oh yes, right in the microwave you go. 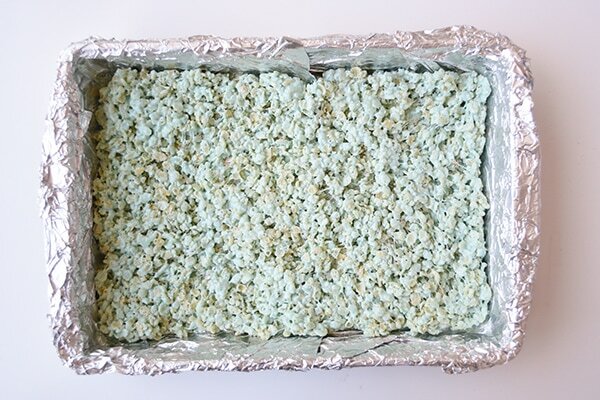 But, turns out they have one more use… making a great Rice Krispie Treats recipe! 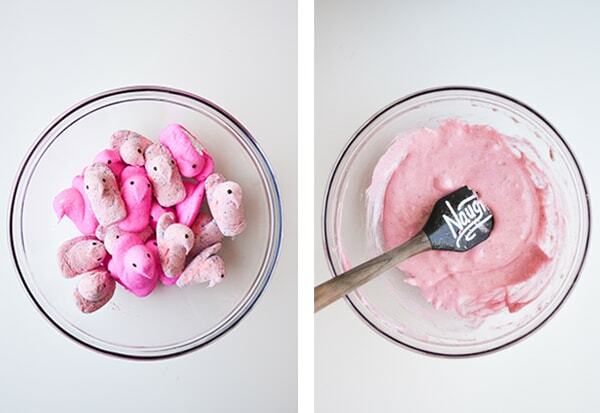 And, if you really don’t want to use the store-bought ones, you can swap them out for 10 ounces of mini marshmallows (that’s a little more than half the bag) or make your own Peeps, like Phillip of Southern Fatty does here. For better or worse, finding them shouldn’t be an issue as they marshmallows are now available in various figures year-round. 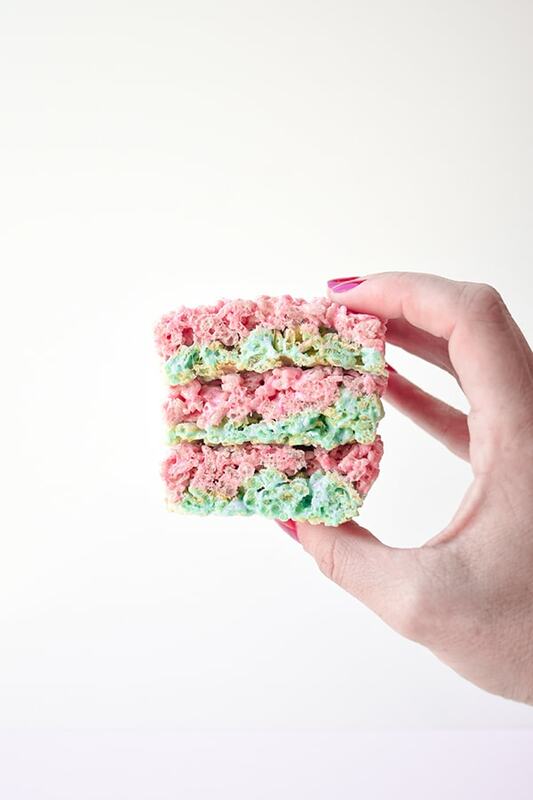 I used to love making Rice Krispie Treats as a kid and I even used to eat the cereal in college (yes, the one with the pre-formed treats) even though everyone thought it was gross. It was not. They were wrong. Now the back-of-the-box recipe is good. But this is even better. To take this recipe to the next level, in addition to swapping out the regular mallows for sugar-coasted marshmallows, I browned the butter and added pure vanilla extract. It’s just as simple (trust me, browning butter isn’t tough), but the changes make this after-school snack simply amazing. For another great Easter recipe, try my Italian Easter Bread! Use browned butter. To make browned butter, simply add your butter to a small saucepan and place it on medium heat. Let the butter simmer and sputter, stirring continually until it turns brown and starts to smell a little nutty. As soon as it turns brown remove it from the heat. Some people cook their browned butter for 8-10 minutes, and I’m sure that’s amazing, but this method takes about 2 minutes and imbues enough nuttiness into the recipe to make me happy. Use pure vanilla extract. I only ever ever ever use pure vanilla extract. It costs more but it is so worth it. And, adding it to this recipe adds another level of deliciousness. Press your mixture gently into your pan. 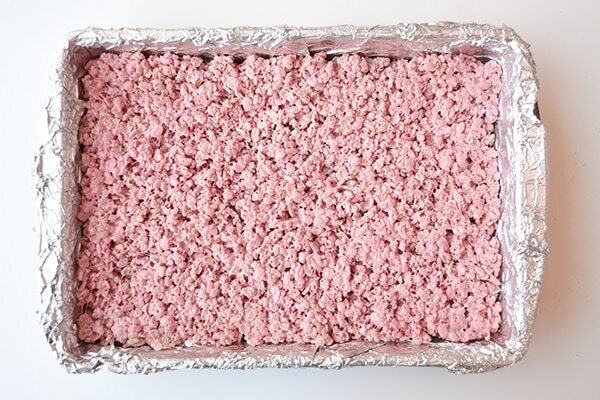 If you press down hard, you’ll turn your Rice Krispie Treats into concrete. Do not cut the Rice Krispie Treats in the pan. You’ll either make grooves in your 9 x 13 metal baking pan or you’ll do like I did and cut a tiny nick into a Pyrex pan and then 3 hours later there will be an explosion noise in the kitchen and you’ll come out to find your kitchen is covered in tiny shards of Pyrex and you’re really thankful that didn’t happen while you were in there because oh my goodness. 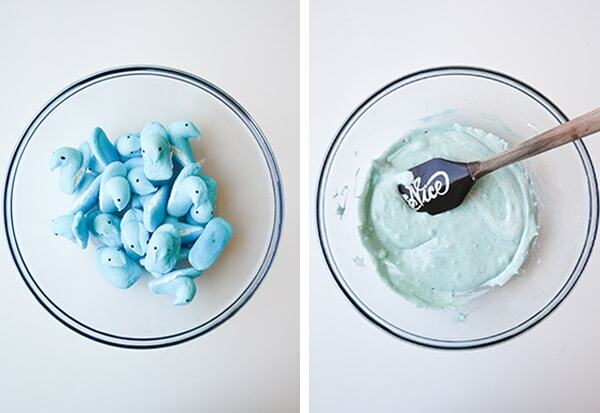 After browning the butter, place half of your blue Peeps in a microwave-friendly bowl and heat them for 45 seconds. Let them rest, and heat them for another 30 seconds. Spray your spatula with cooking spray and pour half the butter and 1/2 tsp. vanilla on top. Mix until combined. Add 3 cups of Rice Krispie cereal. Spray your spatula and stir until combined. Spray your hands and gently press them into the pan. Let them fully cool and then cut into bars! Did you make this recipe? Tag @letseatcakeblog on Instagram! This Rice Krispie Treats recipe uses browned butter, vanilla, and Peeps to take the original recipe to the next level! Cover 9" x 13" pan with aluminum foil or parchment paper. Spray with cooking spray. Place butter in small saucepan and turn to medium heat. Stir continuously until butter has browned and smells nutty, approximately 2 minutes. Remove from heat immediately. Place 2 packages of separated blue Peeps in a large microwave-safe bowl. Microwave for 45 seconds. Microwave for 30 seconds. Pour ½ tsp. vanilla extract and 1½ Tbsp. browned butter over Peeps. Spray spatula with cooking spray and mix until fully combined. Pour 3 cups of Rice Krispie cereal over marshmallow mixture. Spray spatula with cooking spray and mix until fully combined. Press mixture gently and evenly into pan. Place 2 packages of separated pink Peeps in a large microwave-safe bowl. Microwave for 45 seconds. Microwave for 30 seconds. Press mixture gently and evenly into pan. Let cool completely (about an hour). Remove from pan. Spray knife with cooking spray and cut into even slices. 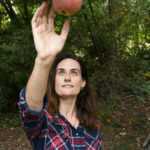 - If you don't have a 9" x 13" pan, you can use a 9x9 or an 8x8 pan. The bars will be taller, but just as tasty. - If you want to use flavored marshmallows, go for it. I used one box of cotton candy ones for these. - Recipe inspired by Yellow Bliss Road's layered Peeps Treats! Did you make this recipe?Tag #letseatcake when posting a photo of your recipe, and make sure to follow @letseatcakeblog on Instagram! 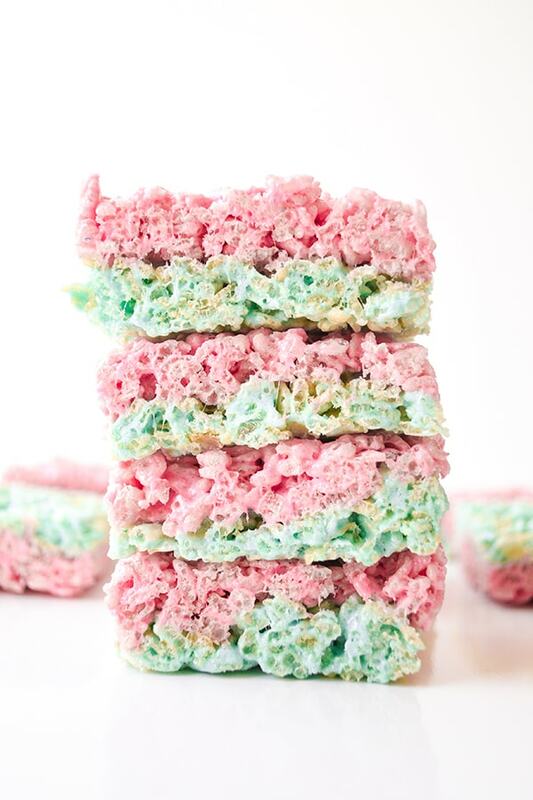 What’s your secret to making the best Rice Krispie Treats? Tell me in a comment below! This is the best way to eat peeps and it makes for a fun rice krispie treat! Love the spring colors! Thank you so much! I might have to remake them around Halloween with orange and purple or Christmas with green and red! Ok you are gonna have to fill me in, what are peeps? I’d not heard of them until maybe 3-4 weeks ago and now I can’t turn around on the ‘web’ without bumping into them… I see that they are some form of coated marshmallow? Oh Brian, you are in for a treat! Peeps tend to get really popular around Easter (I think it used to be they were only released around then in the form of bunnies and ducks, but now you can get them year ’round. I might have to remake these for Halloween with the pumpkin ones). Peeps are essentially a marshmallow coated with sanding sugar, which is why they work for these Rice Krispie Treats. Hope that helps! I may not be a fan of peeps, but these are adorable…and who doesn’t lovvvve Rice Krispie treats?! Such a cute idea…thanks for sharing the recipe! Wow this PEEPS RICE KRISPIE TREATS looks so cute! Love the spring colors! I definitely want to try this! Thanks for sharing this beautiful recipe! These are adorable! I will have to make them for my nieces and nephews, bet they’re gonna love them! I love Peeps, and usually have a ton of them around the house at Easter! I can’t wait to melt some down to turn them into these wonderfully colorful treats! Such a cute recipe! I love this idea for an easy spring treat!